I'll be turning 40 next week - eeek! - although, thanks mostly to raw foods, I certainly don't feel like it! Sure I've noticed a few white hair popping here and there and new lines on my face, but otherwise I feel so much more energetic and alive than I did in my 20s! To celebrate the occasion I'm offering all of my recipe books in electronic format at very special prices! 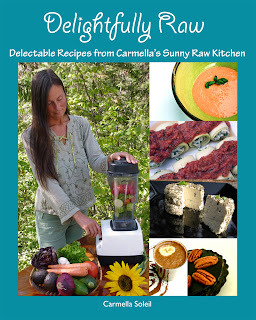 From now until July 12th, you can order The Best of The Sunny Raw Kitchen, The Best of Raw Freedom Community and my new Delightfully Raw at a savings of 30%! 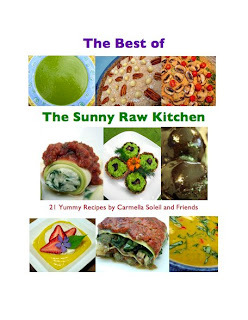 Pay only $7.70 for The Best of The Sunny Raw Kitchen ebook instead of the regular S10.99 and save $3.30! To place your order, click on the link below! 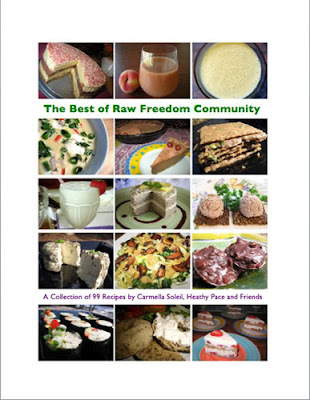 Pay only $9.10 for The Best of Raw Freedom Community ebook instead of the regular S12.99 and save $3.90! Pay only $14.70 for my Delightfully Raw ebook instead of the regular $21.00 and save $6.30! 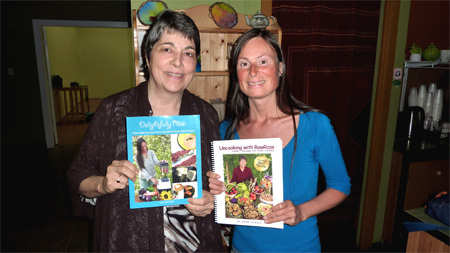 My first two best sellers, The Best Of The Sunny Raw Kitchen and The Best of Raw Freedom Community, can be purchased together in one convenient package. Pay only $15.40 instead of the regular $21.99 and save 6.60! To order this package, simply click on the link below! You can also purchase all three of my books in electronic format in a single package. Pay only $25.20 instead of the regular $35.99 and save $10.80! The ebooks come in PDF format; if you don't already have 'Acrobat Reader' installed on your computer, you can download a free copy at www.adobe.com. 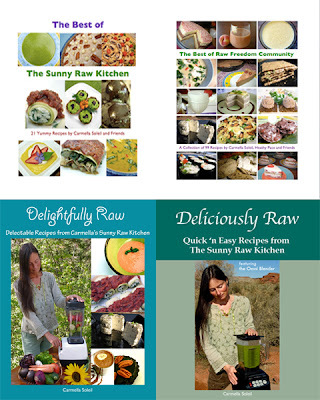 Regulars of The Sunny Raw Kitchen probably already know that I've put together a Recipe Index to make it easier to find at a glance all the delicious yummies that have been posted on this site. 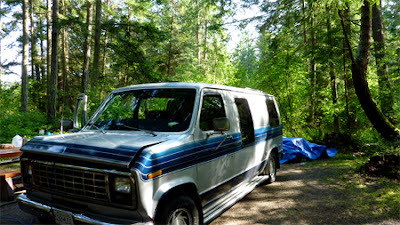 With all our travels in the last couple of years I hadn't been able to keep it up to date - bad, bad Carmi! - but the good news is that it is now done! Woo hoo! Every single recipe that I have EVER shared with you since the start of my cyber kitchen is now listed here. 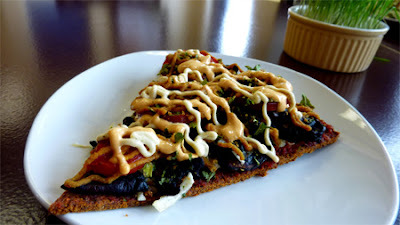 Anyhoo make sure to check out This Blog's Recipe Index here! Oh and please note that you can also access the index quickly anytime via the right sidebar, just below the Google Search Box. Anyhoo, as promised, here's my review of our experience at Rawthentic Eatery in Qualicum Beach on Vancouver Island. As you may recall we decided to stop there on our way to the Comox Valley. That was over a month ago, so the memories aren't so fresh anymore - ooops! My bad! 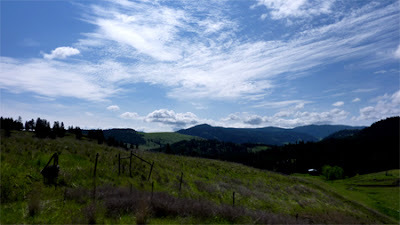 - but I'll still do my best to recapture the highlights. 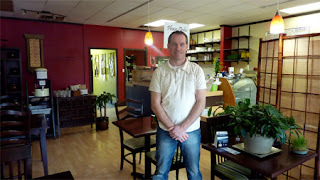 When we first walked into Rawthentic I was immediately impressed by the spaciousness of the place. I mean, Qualicum Beach is after all only a small and pretty isolated town. I'm always amazed to see how the interest in the raw lifestyle has been spreading e-ve-ry-where in the last few years. Woo hoo! Besides the eating area the restaurant also has a small store where raw enthusiasts can purchase some handy kitchen essentials. 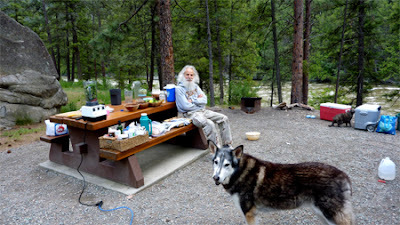 The owner, Bill, happened to be around that day so we chatted for a while as we savored our meal. He's a super nice guy with a vision; his next project is to open a second location in Nanaimo, a larger community that sees a lot of visitors due to its having a couple of ferry terminals. Their menu was a little less varied than what was advertised on their website but still offered 5 or 6 different entrees. I learned that they serve special dishes a few times a month in addition to their 'regular' menu - a nice touch. We opted for a piece of Super Melt Pizza which we were told was a popular item: a thin veggie flax seed crust topped with marinara sauce, marinated mushrooms, tomato slices, crumbled "meat balls", caramelized onions, and their house dressing, all topped off with a nut cheese. Whoa! This was sooooo flavorful! Don and I both loved it! We also shared a wrap which was the second largest we'd ever seen! 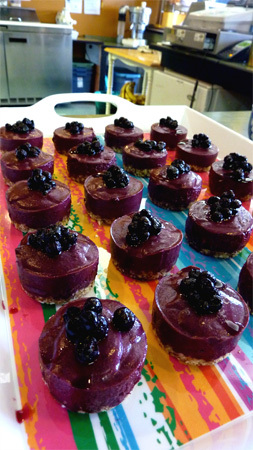 (We enjoyed a ginormous one at Better Life cuisine in Santa Monica a few months ago). 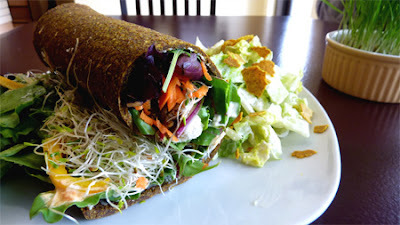 The wrapper itself was made from flax seeds, veggies and spices and was much thicker than other veggie wraps I've had in the past. It was packed with mixed greens, sprouts, red and yellow peppers, Cashew Hummus, Falafel Balls, grated carrot, their house dressing and a special sauce. It was very good and super filling. At Rawthentic they give you the option to order any of the dishes with or without a side salad, depending on how hungry you are. We decided to go with their Caesar Salad: romaine Lettuce, wheat free garlic bread croutons, and sprouts with a cashew based Caesar Dressing. It didn't look like much at first glance but was excellent! 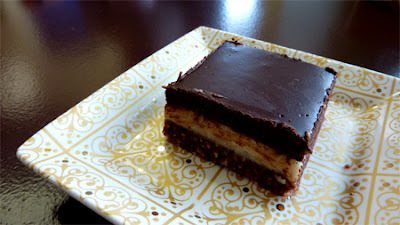 We had a piece of Qualicum Beach Bar, Rawthentic's raw take on the famous Nanaimo Bars. The traditional version consists of a wafer crumb base, topped by a layer of light vanilla or custard flavored butter icing, which is then covered with a thick layer of melted chocolate. 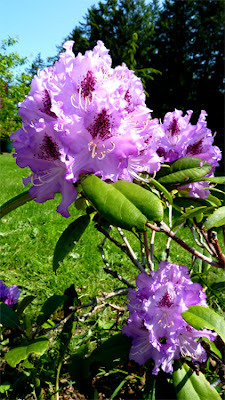 I only tried it once before when I first came to Vancouver Island and didn't care for it much - that stuff is real sweet. I found the QB Bar still a wee bit too sweet for my taste buds but otherwise very yummy. 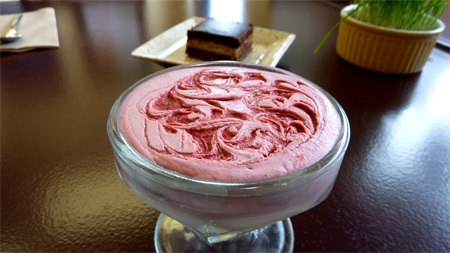 Lastly, we enjoyed a bowl of Strawberry Pudding which is basically the filling of their Strawberry Cheesecake sans the nut crust. This was also very tasty and had a lovely swirl decoration. We were hoping to stop by again at Rawthentic on the way back down the island but that unfortunately didn't work out. Ah well, I'm glad we at least got to check it out! I often get the comment that I should open my own restaurant, but I know deep down that that is not my path. I enjoy being able to be totally creative in the kitchen without having to be concerned with costs and overheads and all those numbers that come into play with the business aspect of things. I am so grateful that others do have that calling, though! 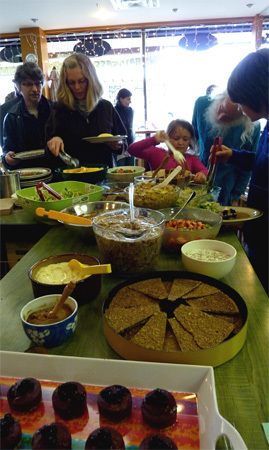 I think that Rawthentic Eatery might have been the 19th or 20th raw restaurant we've had the good fortune to visit in the last 3 years, and it's always such a treat to be able to sit back and partake in the food that someone else has prepared. Kuddos go out to Bill for his rawthentic endeavors! 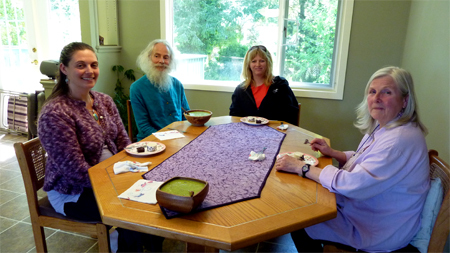 Pat and other raw enthusiasts meet every single Wednesday night at Zen Zero in downtown Courtenay for a raw potluck. Now, that is no small feat! We, of course, joined them while we were there. The food was absolutely delicious and a good crowd turned up. Pat had made a whole bunch of stuff! She brought her Banana Pudding, a great big bowl of Salsa, and delicious Banana Crackers with a simple Tahini Date Spread. Start the crackers the day before. Prepare to soak seeds for 4 hours or perhaps overnight. Soak a minimum of 4 hours, perhaps overnight. Add to soaked seed mix, stir. Process well & add to seed mix, stir. Process only until fairly chunky. Add to mix, stir. Your mix should be not too runny, not too thick. 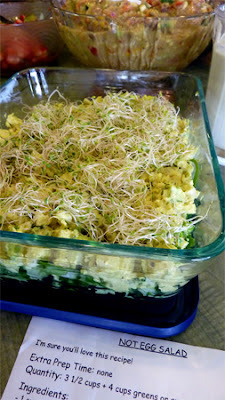 If too runny, add a bit more ground ﬂax &/or sesame seeds. 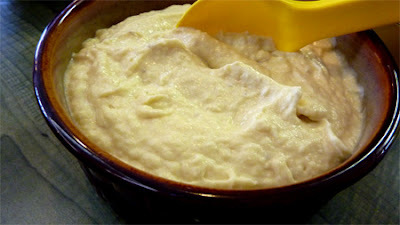 If too thick, add enough water to make spreadable batter. 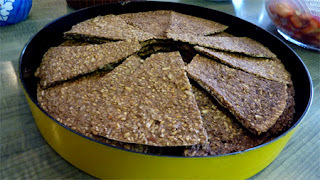 Spread onto Teﬂex dehydrator sheets (do not score into crackers yet). Dehydrate at 125 degrees F. for approximately 4 hours, then reduce to 105 degrees & dehydrate for approximately 8 more hours (or overnight). Turn each cracker mix onto a cutting board & cut - pizza cutter works well - into cracker shapes. Put each cracker back onto mesh dehydrator trays & dehydrate for a further 4 hours, depending on whether you want chewy or crispy. To test, remove a cracker & let sit in open air for a few minutes - decide if that is the hardness or chewiness you desire. Store crackers in a tightly sealed container. Will keep well for about 2-3 weeks. If kept too long, they will lose ﬂavour. Begin preparations the day before you want the jam. Simply soaked dates - agh, about 1 cup, processed with tahini, approximately 1/3 of a cup. Soak dates in enough water to cover for several hours to overnight (if I am making ʻjamʼ for banana crackers, I put the dates to soak at the same time I put the ﬂax, sesame & sunﬂower seeds to soak; at the same time I will put the frozen cranberries in container in fridge to thaw). Drain the dates (I save the sweet date water in fridge & use to sweeten other things or save to soak dates in next time I make ʻjamʼ). Add dates, cranberries & orange to a food processor & process until very smooth. Done! Yum! Lastly, like us Pat loves durian and had also brought Durian Pudding. My Blueberry Pie was such a success at the dinner some nights before that I decided to make it again for the potluck. Marussia, one of the owners of Zen Zero, had brought kelp noodles in a peanut style sauce. It turns out that she has been following my blog for years so it was nice to finally meet. 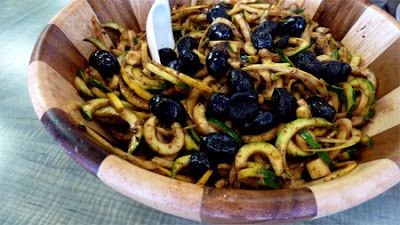 Zucchini noodles in a balsamic marinade topped with black olives. During our travels I've come upon a recipe book published by another woman from BC called Rose. She actually lives in the area and was able to make it to the potluck. Yay! She is such a kind and gentle lady! 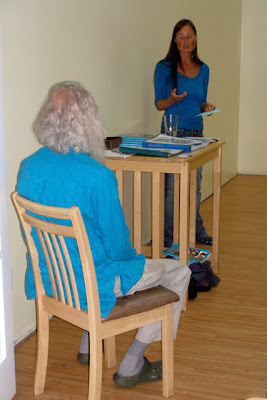 It was also neat to meet another raw author; as you can imagine we had lots to talk about! Rose contributed a really yummy Egg Salad from her book, Uncooking With RawRose – Your Guide to Raw Foods, which she graciously accepted to share with you, my readers. Enjoy! ⇒ Put cashews, water, oregano, salt, turmeric, mustard, cayenne, vinegar and date in a blender, but don’t blend yet (so cashews can soften slightly while preparing the other ingredients). ⇒ Put zucchini, cabbage, celery, parsley and green onion in a bowl. 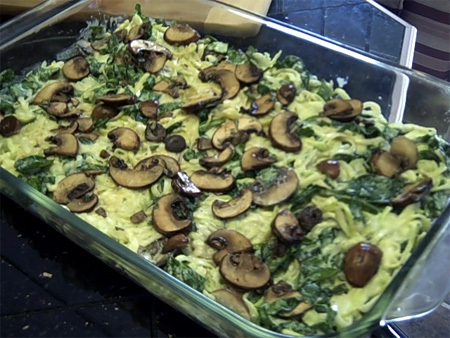 ⇒ Blend ingredients that have been soaking in blender, until smooth, then pour over the zucchini, etc. Combine well. 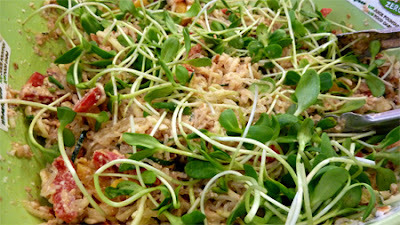 ⇒ Nice served on leafy greens and/or sprouts because the greens/sprouts get coated with excess sauce (besides tasting good and adding nutrients). After the meal I gave a talk highlighting our approach to successfully transitioning to and maintaining the raw diet, which I outline in detail in my Delightfully Raw book. One of our messages is to look at it from the perspective of adding more raw foods into your diet rather that trying to stop eating cooked. As you include some raw recipes on your menu then there naturally will be less and less room for the cooked stuff. We'd planned to give a food prep workshop a couple of days later and debated whether we should cancel it as there were so few participants. In the end we decided to go ahead anyways and I'm so glad we did; it turned out to be a fun and informal affair. On the menu was Green Cucumber Soup, Spinach & Cream Pasta Casserole, Tuna Salad, Blueberry variation of my Strawberry Shortcake and my Fruit & Nut Chocolate Candy. 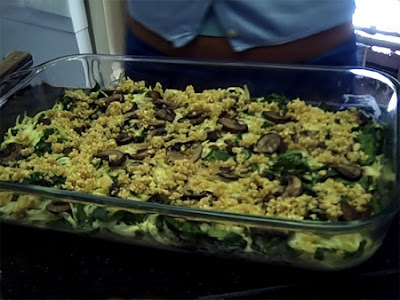 Spinach & Cream Pasta Casserole before the Pine Nut Parmesan and going in the D.
And after about 1 hour at 110 degrees. The day before we left Comox Pat took us to see her friend Stephen Cochrane's gardens. Stephen is the director of Raw BC Society - an organization whose mission is to promote the health benefits of an unprocessed raw food diet and to connect the resources of existing raw food advocating communities around British Columbia. Stephen has been eating raw for the last 20 years and dedicates a great deal of his energy to gardening and self-sustainability. He is also very involved with the Comox Valley Growers and Seed Savers. 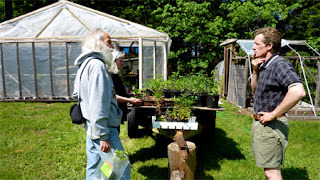 Stephen took some time from his busy schedule in order to give us a little tour of his family's property, share some gardening tips and exchange ideas. 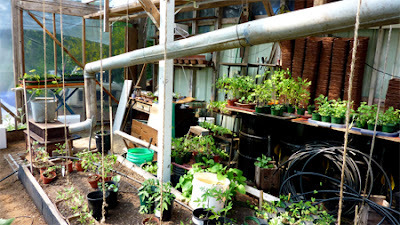 To my delight, he gave us several types of seeds for our own future gardening ventures. Yay! A hothouse ingeniously rigged with a wood stove with an extra long pipe to prevent plants from freezing during the winter months. 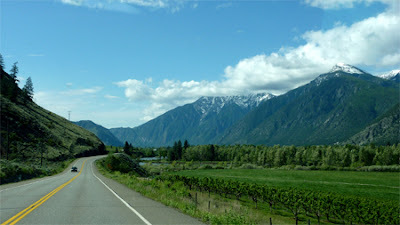 After spending a little over a week in the Comox Valley it was time to get back on the road. Pat came over to see us off and took this photo as we were getting ready to roll. 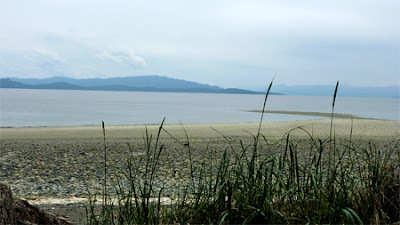 Before leaving the island we decided to spend a couple of days at Rathtrevor Beach Provincial Park, just south of Parksville and about half an hour north of Nanaimo. 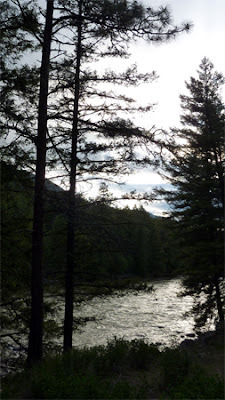 After being in a town environment for a while we figured we could use some time in Nature, plus it would lighten up our journey back to the mainland. 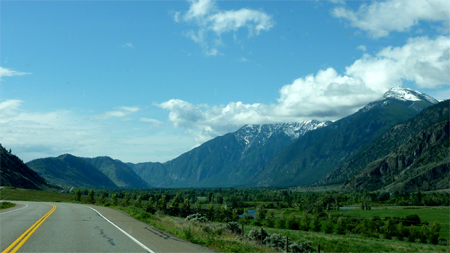 The park is huge, covering some 347 hectares and the campground has over 175 sites. 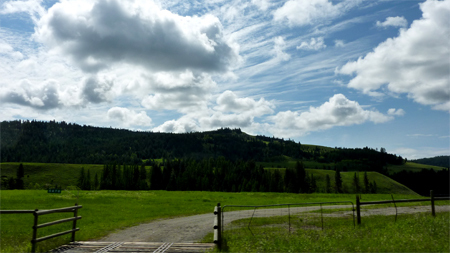 While it doesn't have hook ups there's access to water and several outhouses around the facility. There's also a couple of shower buildings which felt like such a luxury after all the rough camping we've been doing of late. Being on a weekday and out of season the place was virtually empty and we found a great quiet spot. 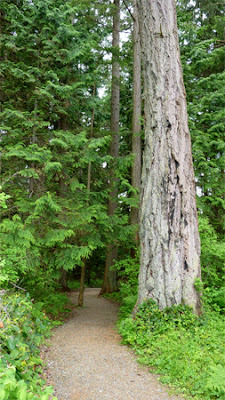 The park offers 5.5 km of trails through forests and along the ocean so we got to walk to our feet's content. 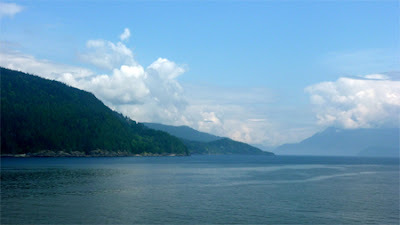 The next morning we woke up early and got on the 10:40 ferry from Nanaimo to northwest Vancouver. 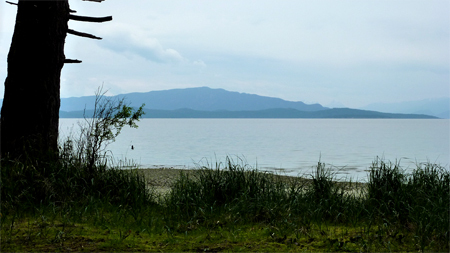 In spite of the predicted rain the weather held off throughout the ride, offering a beautiful view of the gulf islands. 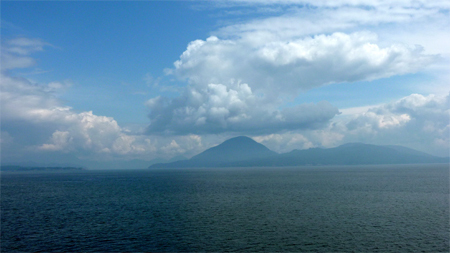 Once on the mainland we were soon met with intermittent showers. 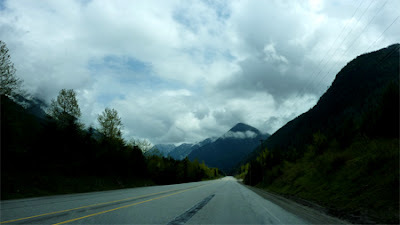 The drive was uneventful and since with the rain and all there wasn't much to see, it gave me a chance to catch up on my blogging. We had planned to stop for the night a few miles passed Princeton but we were getting concerned that we might have to keep going as the rain was falling pretty fiercely; definitely not good camping weather. Thankfully by the time we made it to Stemwinder Provincial Park the sky had cleared up. Phfew! 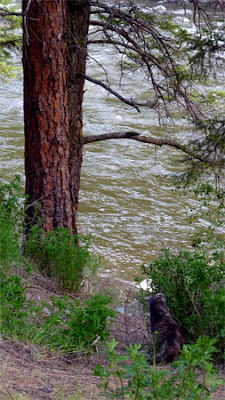 The campground is right by highway 3 but we found a site along the Similkameen River which was running so strongly that we could barely hear the nearby traffic. There she is in the last rays of sunshine. The boys chilling out after the long day's drive. Notice Puss next to the coolers? 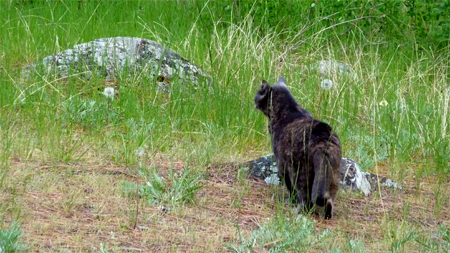 She was just then getting ready to explore our surroundings in earnest. We repacked the van the following morning and continued our travels towards the interior. To my great delight the further we went the more the sky cleared up, offering a stunning spectacle of the most amazing cloud formations. The province is referred to as 'Beautiful British Columbia' and that it truly is. 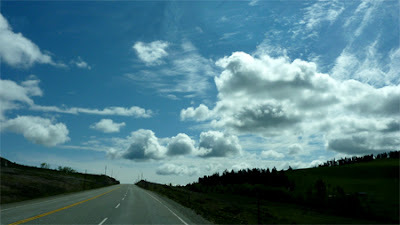 It had been a while since we'd traveled this road and thoroughly enjoyed it. 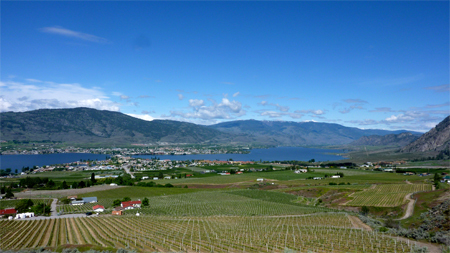 We drove through the Okanagan, the area that supplies the bulk of the fruit that is grown in Canada. 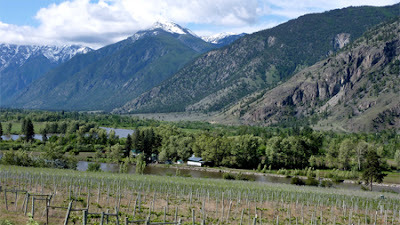 We encountered many fields, orchards and vineyards, testifying to the abundance of the region. 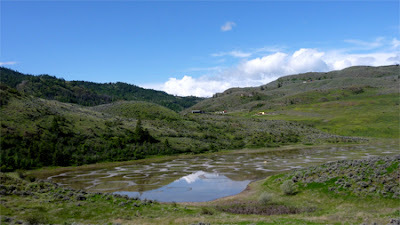 Shortly before we reached Osoyoos we passed by Spotted Lake. 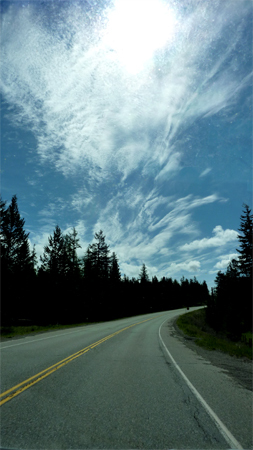 I learned some fascinating stuff about this unique phenomenon on Wikipedia. 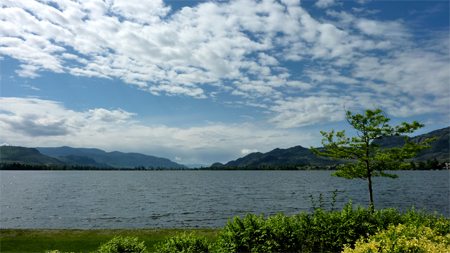 The "lake is very highly concentrated with numerous different minerals. It contains some of the highest quantities (in the world) of magnesium sulfate, calcium and sodium sulphates. It also contains extremely high concentrations of 8 other minerals as well as some small doses of four others such as silver and titanium." "Most of the water in the lake evaporates over the summer, leaving behind all the minerals. Large “spots” on the lake appear and depending on the mineral composition at the time, the spots will be different colors. The spots are made mainly of magnesium sulfate, which crystallizes in the summer. 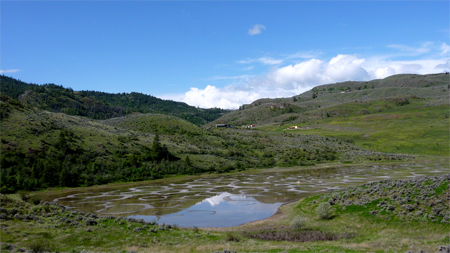 In the summer only the minerals in the lake remain, and they harden to form natural “walkways” around and between the spots." A view of Osoyoos Lake which is located in the heart of town. 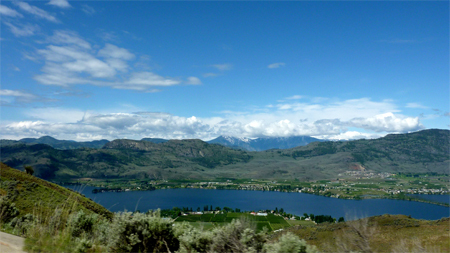 As highway 3 leaves Osoyoos towards the east it quickly climbs steeply up with a number of hairpin turns, offering a stunning overview of the town and its surroundings. More beautiful cloud formations as we continued eastward. The next evening Don pointed out that she had pooped three times during the day - an unusual occurrence for sure - but neither of us thought anything of it at first. I also noticed that she was drinking a lot more water than usual. But what really set off the alarm was when I heard Pu cry in pain and later discovered that her stools were unformed and contained mucus and blood. Eeek! She was otherwise looking fine so I only really delved into the matter once back in Canada. While researching online I discovered that others had noticed similar side effects in their cats after vaccination. In fact in a few cases it had turned into an horror story; their beloved furries becoming unexplainably sick and even some dying within a short time! One woman took her dead kitten to the vet to be autopsied and the cause was determined to be panleukopenia; a feline type of leukemia. Somehow the rabbies vaccine had infected the cat with this extremely rare but very serious condition that attacks the pet's white blood cells. I read that with a deficiency of those defensive blood cells and an ulcerated intestinal lining, diarrhea, intestinal bleeding, dehydration and susceptibility to bacterial infections are the end results. Puss seemed to be suffering from some of these symptoms so I became increasingly concerned and braced myself for the worst. I immediately contacted the vet in Anacortes to explain the situation and he said that he'd never seen such a reaction in his 40 some years of practice. He would have gladly had a look at her but that wasn't an option since we had already left the country. And so we booked an appointment at a local animal hospital for the following morning. 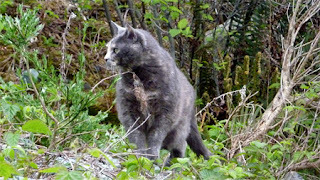 According to my internet findings the prognosis wasn't encouraging as very little could be done to neutralize the panleukopenia virus other than to have the animal hospitalized in an attempt to fight off the dehydration stage of the sickness. In other words: mega bucks which we weren't sure we could afford. By that time it had been 3 weeks since the infamous shot, and I thought that panleukopenia could be safely ruled out as it usually manifests very quickly. 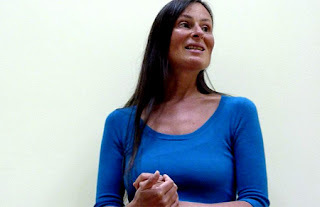 Yet more research revealed that she might be suffering from irritated bowels as an allergic reaction to the nasty chemicals her body had been invaded with. That sounded right to me. At best it was just a minor condition that can be easily treated by giving the digestive tract a little rest. 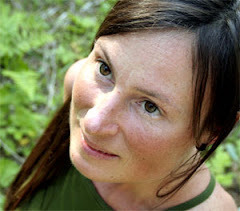 At worst it could have been that she had Irritable Bowel Syndrome (IBS) which would mean changing and closely monitoring her diet for the rest of her life. In any case from what I read I felt that a short 24 hour fast followed by a few days of a bland diet was a good place to start. Being the food lover that she is, Puss of course loudly protested during the fast, pestering us through the night, but we firmly held our ground. While she is normally quite fussy about what she eats she adjusted surprisingly well to her new fare consisting of white rice, boiled chicken and pureed butternut squash (to help absorb extra moisture in her gut and solidify her stools). I also blended in a slippery elm mixture (1 tbs slippery elm powder whisked with 12 oz hot water) - an old herbal remedy for digestive issues that coats and soothes the intestines. On the fourth day I began to introduce 'regular' food again (more about that later). 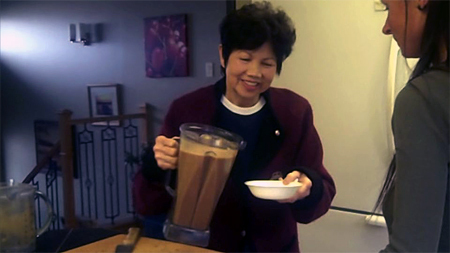 I was anxiously awaiting her bowel movements to see how her body was responding to the fast and change of diet. Every time I checked her litter box, however, I saw that she hadn't pooped yet. As the days went by I became more and more concerned. Ironically she had gone from having diarrhea to constipation! Don's approach was to wait it off and let her body heal itself. 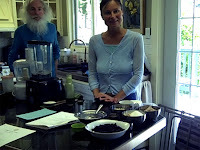 I thought I'd do what I could to assist the process and tried a number of holistic remedies: adding more fiber (chia seeds and squash), olive oil and yet more slippery elm. But after 5 days of that and without result I called a vet. He assured me that there was no cause for alarm just yet as she was still eating and keeping the food in. Things would take a different turn once she would start vomiting it back, an indicator that her colons were completely full. As a last resort I had thought of giving her feline laxative and he confirmed that it was a good idea. Thankfully, Pu actually really loved the stuff which made matters a great deal simpler than having to sneak it in her food or force her to lick it off herself. 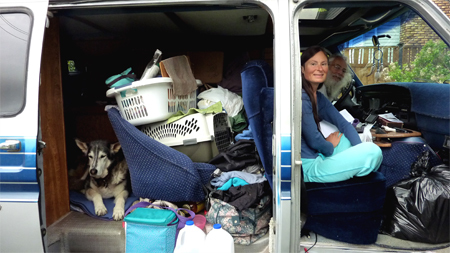 In the meantime it also occurred to me that Pu had been cooped up in the van for over a week, as Arabella's house is located on a busy road which made it a little tricky to let her out. I felt that some exercise would no doubt do her a world of good and perhaps help to get her intestines going. On the down side it meant that I wouldn't be able to monitor her bowel movements. Still, I thought it was worth the chance so I took her in my arms and relocated her in the back yard, which she happily explored for a few hours. When we left Comox the following afternoon we also let her wander around our site for the two days that we spent at Rathtrevor Beach. Over the past several years Puss' diet has consisted mainly of dry kibbles. The only bit of raw that she's been getting is an egg yolk when she's in the mood - like I said she tends to be a fussy eater. Don and I decided to take this opportunity to switch her to a mostly raw meat diet which is what cats are really designed to eat anyways. Not up to handling raw flesh (ewww!) 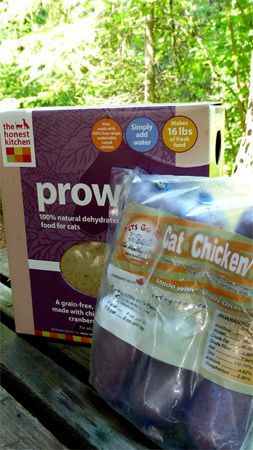 we went instead with Prowl, a dehydrated human-grade whole foods preparation that we found at a specialty pet store. I started off by mixing it with a high quality grain-free canned food, crossing my fingers that she would like it. She was a little hesitant at first but remarkably soon chowed the whole thing down. Yay! 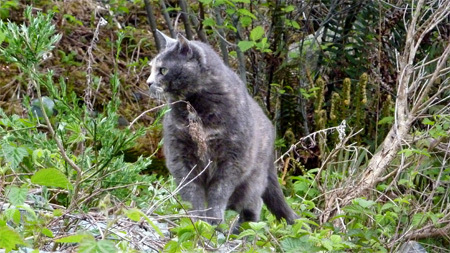 A few days ago I've switched her to fully raw, giving her Prowl along with a mixture made by Pets Go Raw (comes frozen). Pu also took to our new routine of my feeding her every 5 or 6 hours instead of her having access to food whenever she wants. The only downside is that she's been waking me up in the wee hours of the morning demanding her breakfast. lol This new approach should take care of the emotional eating that we'd notice her doing from time to time. And who knows, perhaps she'll even shed a few pounds which she could definitely afford! 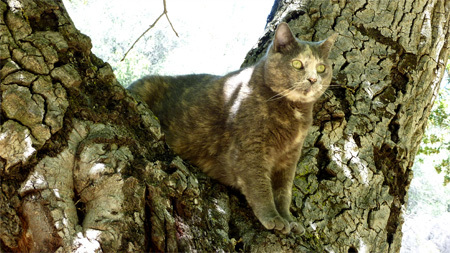 While the whole vaccine incident was a good reminder that Puss isn't immortal and that one day she will leave us, I am grateful that that time hasn't come just yet. On the positive side it has turned out to be an indirect trigger to improving the quality of the food that we feed her, which she is bound to reap health benefits from.